The world's largest concentration of treehouses is found in Cave Junction, Oregon, where builder Michael Garnier has built a treetop metropolis at the Out'n'About Treehouse Treesort. "I think it fits in with the state of Oregon perfectly," says Garnier in a video produced by FairCompanies. "That's part of what this environment is, it's part of what Oregon is -- it's tree-ific, it's tree-mendous." Garnier says he founded the ‘treesort‘ in an effort to make a living off Oregon’s number one natural resource — trees — without cutting them down. When Garnier got started building treehouses, he attempted to get a building permit from the county and was rejected because the proposed structure lacked a concrete, treated wood, or masonry foundation. He ended up building anyway, and to prove that the treehouse was structurally sound, he packed it full of people, and it quickly became a national news story. 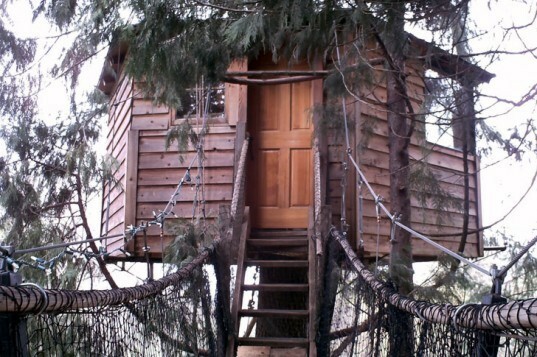 Several years later, he was able to obtain a building permit to build treehouses legally. Garnier has become something of an expert in treehouse construction, using sliding brackets that allow the trees to move without tearing the treehouses apart. The treehouses are accessed by a series of ladders and spiral staircases, and guests can roam around on catwalks that connect the treehouses. Because some of the treehouses are located as high as six stories above ground, the housekeepers at the Out’n’About Treehouse Treesort use ropes and pulleys to raise and lower cleaning equipment. At roughly 350-square-feet and 37 feet above the ground, the tallest treehouse is also the largest, and it features a lofted sleeping area. This treehouse in the Swiss Family complex has a large open-air platform beneath it. For eight years, Garnier battled Josephine County officials over building codes, and he was ordered to shut down several times. Now, the Out'n'About Treesort is a licensed, family-friendly bed & breakfast. The Pirate Tree is one of the more rustic treehouses on the property, and it features a ship's wheel. The Treeloon treehouse is a large treehouse designed by Michael Garnier that looks like an Old West-style saloon and is supported by five small trees. 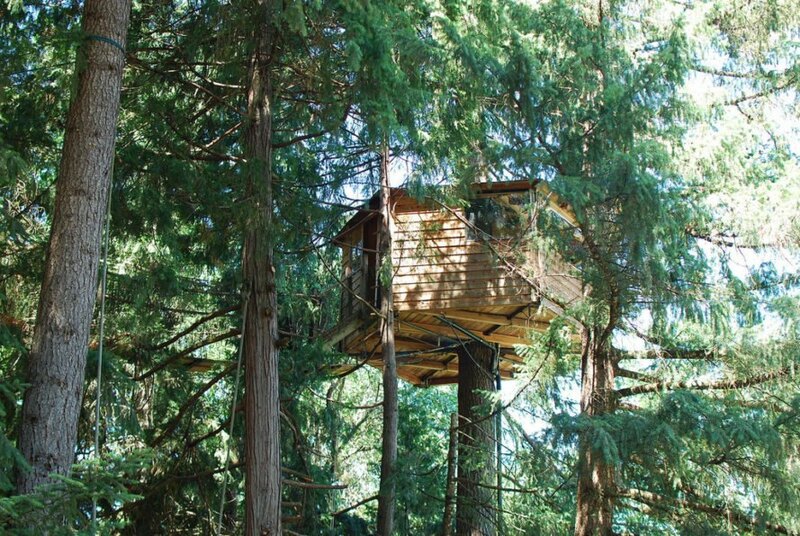 The tallest treehouse at the Out'n'About Treesort is 37 feet off the ground -- not for the acrophobic! In some of the taller treehouses at the resort you can feel the trees swaying in the breeze. Prices at the Out'n'About Treesort range from $120 to $280 per night.